Patrick Victor Martindale White (28 May 1912 – 30 September 1990), was an Australian author. He is an important English-language novelist of the 20th century. From 1935 until his death, he published 12 novels, two short-story collections and eight plays. White's fiction uses humour, ornate prose, shifting narrative vantage points and a stream of consciousness technique. In 1973, he got the Nobel Prize in Literature. He was the only Australian citizen with the prize until the South African-born J. M. Coetzee became an Australian citizen in 2006. His novel The Vivisector was close to winning the Lost Man Booker Prize in 2010. White was made Australian of the Year for 1974. 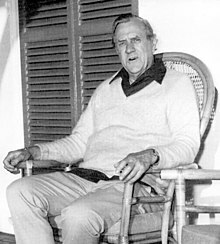 Patrick White and Christina Stead are widely called the most important Australian novelists of the 20th century. Bread and Butter Women (1935) Unpublished. The School for Friends (1935) Unpublished. Return to Abyssinia (1948) Unpublished. ↑ "Australian Nobel Prize Winners". Whitehat.com.au. 2 December 2006. Retrieved 1 September 2011. ↑ Lewis, Wendy (2010). Australians of the Year. Pier 9 Press. ISBN 9781741968095. This page was last changed on 11 December 2018, at 12:10.